Last week on Movie Gadget Friday we kicked off our two-part series in honor of the late Arthur C. Clarke with 2001: A Space Odyssey. This week continues our tribute as we look into some of the support systems on board Discovery 1 and the Leonov in 2010: The Year We Make Contact. While we hear Dave Bowman proclaim "My God, it's full of stars", we can't help but dig through this film full of gadgets. Designed as an artificial emotional intelligence machine, the HAL 9000 and SAL 9000 require human interaction for enhanced performance. Represented by a blue camera eye and female voice, SAL 9000 served as a guide to monitoring potential reactions by the previously disabled HAL 9000. Both machines incorporate keyboard and audio input to communicate with intelligent carbon-based lifeforms (read: us). The HAL 9000 is adept at facial, vocal, and vital sign recognition and makes decisions based on a strict understanding of logic. HAL maintains numerous responsibilities while acting as the brain and central nervous system of Discovery 1. Though HAL appears to be programmed to protect the crew, there are obvious and inherent flaws in his logic programming, resulting in -- spoiler alert -- in committing homicide to resolve conflicting commands. More after the jump. Similar to the pods seen on the vacant Discovery ship, the hibernation system on board the Alexei Leonov serves as a way to minimalize vital needs to the bare necessities. In fact, people in hibernation breathe on average of once per minute and are said to not experience any amount of REM. The system attaches a series of electrodes across various places of a person's body to monitor EEG waves among other bodily functions. The cryogenic hibernation technology is fully operational and applicable to long-term missions that require the use for saving valuable resources along the way. The pods and people are hooked into a series of life support systems that are then able to be controlled by autonomous on board computers if need be. Due to the potential for unstable, logic-based decisions resulting in the imminent situation of a machine like HAL 9000 murdering crew members, a non-conducting blade device was devised as a back-up plan to disconnect HAL before the crew found themselves, um, disabled. 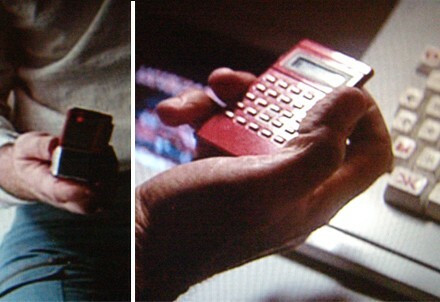 The device is hooked up to a remote controlled trigger disguised as a red calculator. Detonation is triggered by punching in nine nines, selecting the square root, and then the integer. Installed inside a critical location of HAL's wires, the non-conducting blade is sure to not create any short circuits when triggered. Ariel Waldman is a social media insights consultant based in San Francisco. Her blog can be found at http://arielwaldman.com.